Home Agency DOH Executive Firecraker Ban Government News President Trending DOH is pushing an Executive Order regulating the use of firecrackers or the firecrackers firing act. 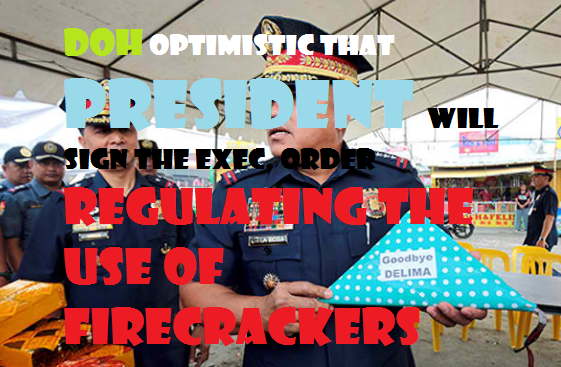 DOH is pushing an Executive Order regulating the use of firecrackers or the firecrackers firing act. From 904 fireworks-related injuries to 323, Health Secretary Dr. Paulyn Ubial expressed optimism to sign the proposal by President Duterte. Even though a large percent of lowered-related injuries were recorded of about 36% from the previous year, Department of Health is pursuing an act to be signed for it. According to Sec. Ubial to avoid unnecessary injuries from firecrackers, the Philippines need to have a law on regulating firecrackers. He also added that Department of Environment and Natural Resources also supports the propose act. Aside from that, the Department also notices a number of victims during the celebration from stray bullets. If this will be signed it will help the authority easily determined on where these gun shots came from. Thank you for visiting "apttrendingph.com". If you have any other recommendation to make this site more fruitful and accurate in promoting and giving news about the Philippines, you are more welcome to write down your comments, suggestion and feedbacks below. MABUHAY ANG PILIPINAS.